This instrument is about as rare a concertina as you can get. To our knowledge just 20 of these were made by Lachenal, of which only 8 were sold (the remainder being scrapped when Wheatstones took the Lachenal business over). Of the remaining 8, an unplayable one is in the Horniman Museum and three playable ones (including ours) are in private hands. What happened to the others? In 1935 - 36 Lachenal, like the other concertina makers, was feeling the effect of major competition from the accordion makers. Their response was this amazing instrument. 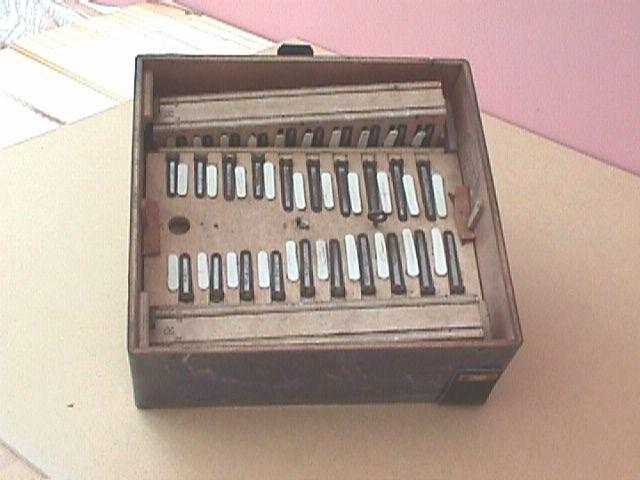 The idea was to produce an English concertina with an accordion sound, so they put three reeds onto every note (2 playing the same note and one an octave below). Unfortunately being concertina makers they made it like a giant concertina instead of using far cheaper and more appropriate accordion technology. It must have cost a small fortune to build each one, and they never made back the tooling-up costs. This has truly been described as the instrument that brought Lachenal down. The word Accordeaphone is cut into the fretwork at both sides. 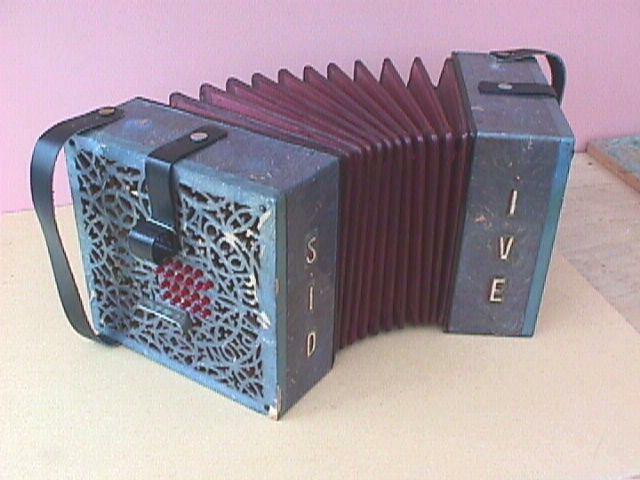 The name "Sid Ive" is clearly painted on the front of the instrument, and the case has a professional card inside it for "Syd. Ive, English Concertina, 110 Gladstone Avenue, Wood Green, N22". If anyone knows anything of this person, we would dearly love to know! This picture shows the interior, with its beautiful joinery, layer upon layer of reed pans and mass of concertina reeds - there are 40 buttons with 3 reeds for each note in both directions, a total 240 reeds! No wonder it cost so much to make.